Although progress was historically slow, televisions have come quite a way from the big forms with standard definition resolution. Today, they offer 1080p resolutions (with 4K seeping into the market! ), the ability to watch 3D movies, sport thinner and lighter designs, and are more energy efficient. However, most people would expect all of those fancy features to come at a cost. In some cases that’s absolutely true, but not all of them. To test out whether a TV can be feature-filled yet affordable, I bought myself a Vizio E320i-A0 32-inch 720p 60Hz LED Smart HDTV, which came in at $288 ($290 at retail price). I tested it out based on its design and features for the price to see whether I felt it was a good pick, even as a budget TV. At the end of this review, you’ll be able to enter for a chance to win one for yourself! The Vizio E320i-A0 TV doesn’t have many competitors for its offerings and price. The only two I’ve been able to find is the Samsung UN32EH4003, which also comes in a 32-inch size with a 720p 60Hz LED screen, currently priced around $260 on Amazon ($420 at retail price) but it doesn’t have any network connectivity. The second competitor is the Toshiba 32L1350U for around $250 on Amazon ($350 at retail price) — it supports 3 HDMI inputs but again, this one also lacks network connectivity. 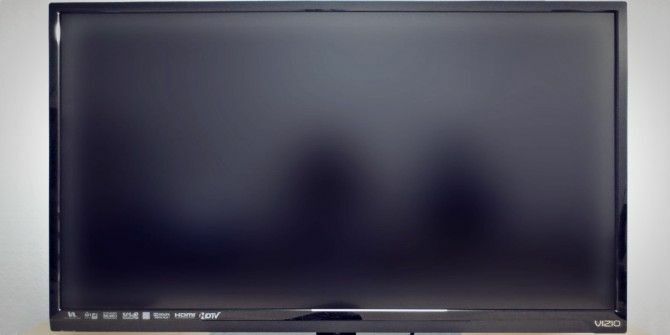 It seems that, unless you happen to get a really good deal, there are no competitors that come close to the Vizio E320i-A0 Smart TV in terms of features and price. The Vizio E320i-A0 Smart TV was nicely wrapped to prevent any damage during transportation. It was covered in a plastic bag and then protected by styrofoam bumpers at both ends of the TV. An informational packet was included to help set up the TV, a stand to screw the TV onto, a power cable, and a remote with batteries. Any other accessories will need to be bought separately. Overall, this is a decent and respectable list of specifications. There’s nothing amazing about it, but nothing bad either. The Vizio E320i-A0 comes with a very sleek design. With dimensions of 28.8″ x 19.2″ x 5.8″ and a weight of 13.5 pounds, it is both thin (although not extraordinarily thin like some of the high-end TVs) and lightweight. It’s certainly thinner and lighter than the HDTV that I’ve had for the past 6 years. The material is hard plastic — glossy in the front and matte in the back. It also includes a simple port design. At the rear, you’ll find one of the two HDMI ports, component connectors, and the Ethernet port. On the left side lies the other HDMI port, the USB port, audio out connectors and an optical in port. Setup of the Vizio E320i-A0 TV is very simple. The installation of the base stand was pretty straightforward as I only had to tighten one screw with the provided metal tool. A quick configuration of the remote and a channel scan later, the television is up and running. It can easily recognize analog and digital channels, so HD channels are quite easily found and viewable. Of course, if you use a TV box to receive your service, you’ll be using the HDMI connection anyways and switching between channels with the box. Despite including a 32″ screen, the Vizio E320i-A0 TV Smart TV and its 720p resolution manages to provide a very clear picture. I was surprised that this was the case, as there are plenty of smaller monitors and TVs which feature a 1080p resolution. There’s nothing really to complain about here — the resolution works fine, the colors appear nice and are configurable, and the screen also includes automatic backlight control to both enhance darker scenes and increase energy efficiency. In fact, the energy guide sticker that came with the TV said that it would only cost $6 of electricity (on average) per year to use the Vizio E320i-A0 TV. This was below the set scale for similar TVs, which ranged from $11 to $30. The resolution is acceptable for a “small” TV because you won’t really notice a difference unless you put your nose right against it. Other reviews mention that the picture quality may be better on Samsung models, but they are more expensive anyways, plus as a budget option, I’m perfectly happy with Vizio E320i-A0 TV’s picture quality. The sound performance is borderline acceptable, but absolutely nothing to write home about. In fact, one of the few downsides to this TV is the sound. In order to keep a thin border around the screen, the speakers are placed along the bottom of the unit, meaning that all audio is fired downward. Therefore, it can sound distorted, tinny, and otherwise a little weird. While I’d certainly like for the audio to be better, I can deal with it since it’s not that big of a deal, it’s practically the only downside of the TV, and it’s a budget TV anyways. The volume is great, however, so each of those combined 20 Watts are put to full use. As a smart TV, one of the best features is the selection of apps. The apps appear to be powered by Yahoo’s App store, so you’re able to install and remove apps as you please. The selection of apps is rather large, ranging from stocks to Facebook to Pandora to Netflix and YouTube. 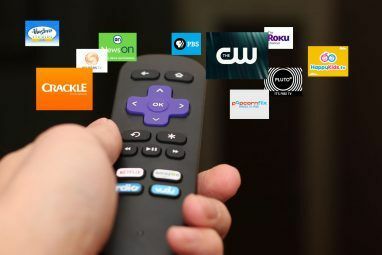 If you’ve ever used apps on other TV devices such as the Roku 3 Roku 3 Review and Giveaway Roku 3 Review and Giveaway As more content becomes available online, the need for a traditional television subscription may not be enough anymore to justify the costs. If you’re already subscribed to services like Netflix or Hulu Plus, now may... Read More , then these apps will seem very familiar. Of course, each app will offer a different interface, but they will all offer that service’s functionality on your TV. This is fantastic as you’re able to stream from various services straight to your TV, without having to connect a laptop or HTPC system. The Store also acts as an update system, allowing it to retrieve firmware, store, and app updates from the Internet to improve performance, fix bugs, and add new features. 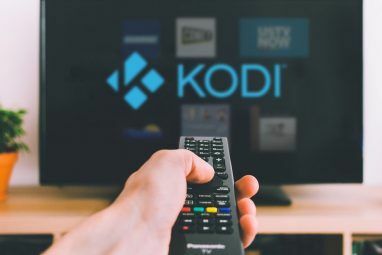 This also means that during the life of the TV, if a new service becomes popular, you may eventually be able to find the app for it without having to buy a new TV. As the progression of software usually makes older hardware obsolete, this definitely prolongs the lifespan of the Vizio E320i-A0 Smart TV. The included remote controller is generally pretty simple as it includes most buttons you would normally expect. There is a special Vizio button in the middle that can launch the App Store, where you can choose to open already-installed apps or add/remove others. This is needed to access most of the available apps, because the three shortcut buttons located at the top of the remote are hardcoded to open Amazon’s video service, Netflix, and M-Go. I also know that bigger TV models may include a full keyboard on the backside of the remote to make typing search terms a lot easier, but this specific model does not include that. The Vizio E320i-A0 TV also offers a few other settings to get the best possible viewing experience. For example, you can change the picture, audio, and network settings pretty easily via its easy-to-use menu. The network settings are especially important as you’ll have to configure the built-in WiFi with it if you choose to use it with your home wireless network. The Ethernet connection should configure itself automatically unless you have any special settings set on your router. Other settings include input selection, picture wideness (such as standard, wide, panoramic, etc.) for standard-definition channels, a sleep timer, and a few miscellaneous settings that you most likely won’t need to change unless you have special needs. So, as a budget option, is the Vizio E320i-A0 Smart TV worth the money? I’d say so, as it packs a handful of nice features in an affordable package. There’s nothing really spectacular about the TV besides the apps it can run, but it certainly offers more than what’s necessary at its budget price. Overall, I’m very happy with the TV, and the Vizio brand. MakeUseOf Recommends: Buy, it’s a great budget TV! Congratulations, Jenny Ham! You would have received an email from jackson@makeuseof.com. Please respond before September 12 to claim your prize. Enquires beyond this date will not be entertained. Explore more about: MakeUseOf Giveaway, Television. I had a Vizio 70" for a little over 2 years when half of the screen went dark. I had a tech come out and he told be this is a common problem with Vizio's and the panel would need to be replaced at the cost of $2000. I contacted Vizio support by phone and email explaining the problem hoping they would do something since it wasn't very old. I was told that since it was out of warranty there is nothing they would do. I went to an appliance store to research another tv. When asking what a good brand would be I was told by both sales persons to avoid Vizio's. When I asked why they said that "They don't last." They have more problems with Vizio's lasting only a couple of years than an other brand. I would suggest avoiding Vizio's. Vizio E320i-A0 32-inch 720p 60Hz LED Smart HDTV!!! I would buy the Vizio. Great question! I'm actually saving for a Vizio right now and $300 will get me a nice one! The Vizio E320i-A0 32 in. Smart TV looks awesome. Vizio E320i-A0 32-inch Smart TV! I'd buy this Visio t.v.! Vizio E320i is what I would buy. Looks like a beautiful television! I would buy the Vizio. It wouldn't be my first TV from Vizio. The Vizio E320i-A0 32-inch 720p 60Hz LED Smart HDTV looks like a GREAT buy for my $300. I would buy vizio smart tv if I have $300 because you can watch 3D movies and has lighter designs. I would buy the Vizio E320i-A0 because I respect your review. This would be so nice to win as we only have an old school TV in my sons room and it takes up just about all the counter space! Would LOVE to win! Eh, this one would be all right. The largest HDTV that's on sale for under $300! The cheapest one so I had more money to spend on crafts! If I only had a budget of $300, I'd buy the Vizio E320i-A0 32-inch 720p 60Hz LED Smart HDTV, of course! $300 smart TV looks good. Vizio. We have one now and love it. A Vizio E320i-A0 32-inch 720p 60Hz LED Smart HDTV. It can become bros with my Samsung monitor for extra gaming. I would buy this TV but hopefully maybe i'll win! After reading this review, I would probably buy a Vizio TV!!!!! Vizio E320i-A0 32-inch Smart TV. DUH! A budget of $300? I'd settle for not upgrading. My current Vizio Razor is good enough for now. I'd rather save that $300 for a down payment on something worthwhile. Would love this for my room. Having surgery soon and this would be great for recovery! Would love this for my bedroom. Having surgery soon and that would be great for recovery! I would love to win this tv. Which TV would you buy if you only had a budget of $300? Probably a 40-42" lcd during black Friday, ofc its never in my budget unfortunately. I'd get this Vizio E320i-A0 TV because it has the network connectivity which other tv's in the same price range lack. The Vizio E320i-A0 32-inch 720p 60Hz LED Smart HDTV of course! Well, I'd buy the Vizio E320i-A0 Smart TV, of course. I'd buy a TV similar to this one! I would buy Toshiba 32L1350U. That's hard to say! If I only had $300 I would likely check garage sales first, then if nothing good showed up I would try the Vizio. If that didn't seem like a good fit, maybe I'd get a non-smart TV. This Vizio E320i-AO 32-inch 720 60Hz LED Smart HDTV would be the one to choose, Yes! I would definitely buy Vizio E320i-A0 32-inch 720p 60Hz LED Smart HDTV. I would save more money to be able to get the TV I want. Probably the vizio- great price! I would buy this one. Maybe the one you are reviewing, looks great. is fine at a distance....so I pick the Vizio. Which TV would you buy if you only had a budget of $300? Easy - a refurb of a not-so-budget TV. I can't think of the last device that I bought that wasn't a refurb. My "main" TV is a Phillips that had the best picture I've seen- originally priced at about a grand, with a discount I got it for 349.99. Not too shabby! Would have to be this one! Probably buy a Vizio. Best bang for buck with fairly good quality. I would buy a Vizio E320i-A0 32-inch Smart TV!!!!!! Well, probably a S?o?n?y? TV as big and as high resolution as possible minus the network features, with decent quality. But the E320i is fine too. I would love to buy it because i never use a 32 inches t.v. and my t.v. is a old class t.v. which i think is too bad for now days high quality movies. I would def get the Vizio E320i-A0 Smart TV! The Vizio should be a good buy around $300. I would buy the Vizio E320i-A0 32-inch 720p 60Hz LED Smart HDTV its under 300 $ and it has cool features. Which TV would I get for under $300? Well, this Vizio looks REALLY nice!! Especially considering my only TV, a 13 year old Sony Trinitron 32, blew something about a month ago. I can't afford a new TV right now-not until next May. This one, probably! It would be great to have an extra TV for Netflix. Probably this one or the Samsung one so I would have Anynet+ with my Bluray player. I know of people that own last years model and they love it! The only apparent difference between that model and the new model... is the frame is now thinner and shows you more picture...whats not to like about that! I don't know which I would buy but I would come here and go over the reviews first. Maybe a Samsung or Panasonic 32" LED tv. I would buy this Vizio as I don't like shopping and comparing all of the options so since you already reviewed it and gave it a thumbs up then that is the one I'd go with. I would buy the biggest and brightest screen, I could find and hook it up to a Roku and some decent speakers. If I only had $300, I might consider using Craigslist to find a higher-end model from someone who's moving. looks like a great product, would love one.. Probably this TV. I really like the built in apps. Well the correct answer would be a Vizio E320i-A0 32-inch Smart TV. Vizio E320i-A0 32-inch is perfect for kids! Well, this TV, Vizio E320i-A0, is described as decent one, so would like to win one. I would buy the one reviewed here. I would love to own the Vizio!!! any tv that looked the best. Pretty sure I'd be buying this TV if I had the cash right now, need one for my TV-less home! The Vizio. Great size and features for basement family room. The Vizio. Great size and features to add to basement family room. I'd buy the Vizio 32 inch:) thanks for the chance! GREAT review! Loved the detail!! Would like to have this for my kitchen. Would love to win this for my 71 year old mother. She has an old heavy tv the dog almost knocks over every day when the mail man comes. I actually DID only have a budget of $300 when I bought our main TV, so I bought the cheapest I could find. On sale. 40" Coby. Gosh, with $300 I would certainly buy the Vizio featured here. Probably the Sceptre X408BV-FHD 39-Inch 1080p 60Hz LCD HDTV . THE 32 INCH SMART TV FOR SURE!! Vizio 320i-A0 32 in 720p 60 Hz LED Smart Tv sounds like it would fit the bill perfectly, with everything it has to offer as well as the price! Vizio E320i-A0 32-inch 720p 60Hz LED Smart HDTV would be my choice. For under $300, this one of course! Vizio ! Of Course ! I think I will buy new monitor and connect it to my laptop. i would buy the above mentioned Vizio E320i-A0 32-inch 720p 60Hz LED Smart HDTV. It looks like a winner to me. I would definitely buy the Vizio for under $300! I would definitely buy Vizio E320i-A0 32-inch 720p 60Hz LED Smart HDTV! If I only had a budget of $300, I will buy a Vizio E320i-A0. I'll buy this Vizio tv, much better if it goes on sale! The Vizio E320i-A0 32-inch Smart TV! I think you've chosen well. If I had a budget of $300, I'd get a Vizio E320i-A0 32-inch 720p 60Hz LED Smart HDTV too. I would buy this one, cuz you told me to! Looks as if the vizio smart tv is the way to go. This vizio seems to be the go to choice. I would love to win this as I have a big old clunker in my living room, this Vizio E320i-A0 32-inch Smart TV would take up so much less space. I would purchase the Vizio E320i-A0 32-inch 720p 60Hz LED Smart HDTV on a budget of $300! Would make a good fit in the bedroom !! The Vizio E320i-A0 32-inch sounds like the best TV in the low end price range.I guess it would be the one. the tv sounds great. hope i win. I'd love to own; Vizio E320i-A0 32-inch Smart TV. I am liking the specs on the Visio so probably go with that. I would by a Vizio, really great specs. If I only had $300 to spend on a TV, I'd probably just tough it out and keep saving! I would get a WiFi Smart TV. A $300 tv? If I had that as my budget, I might as well buy the Vizio E320i-A0 32-inch Smart TV. If I had a budget of $300, I would buy a used TV on Craigslist to save money because everything is cheaper used. I would probably purchase a Vizio E320i-A0 now that I know all the things it features and the low price. I've been thinking of buying a 32" TV for the past few months. This one will fit the bill nicely. thanks for the review! I would buy the above Vizio 32 inch smart tv!!!!! I still cant believe it's below 300! Definitely Vizio! My sister has a Vizio ~ loves it! I’ll choose to buy myself my very own Vizio E320i-A0 32-inch Smart TV! Okay, I didn't want to be one of those people who just added the TV above because I wanted to enter the contest. So I looked around and honestly found that this TV stacks up really well. I want Vizio E320i-A0 32-inch 720p 60Hz LED Smart HDTV . I currently have a 27inch Vizio, no network, 2 HDMI ports. Port (2) is for Tivo Primere XL and Port (1) is for my Asus Win8 Notebook to play games, PlexDesktop and HuluDesktop. I don't really have a specific tv I want. I just wish I could have any good HDTV monitor. Visio Smart TVs are pretty cool. I was also looking at a couple other 32" TVs, like the LG Internet TV or the Magnavox 32" LCD TV. I'd buy the Vizio E320i-A0 32-inch 720p 60Hz LED Smart HDTV....looks awesome! I don't know well the other options, but this Vizio E320i-A0 32-inch seems like a good choice! That's a no-brainer...this Vizio would be the perfect answer!!!! Naturally the Vizio E320i-A0 32-inch 720p 60Hz LED Smart HDTV! If I had a budget of only $300, I would purchase the Vizio E320i-A0 32-inch Smart TV. I would go for Vizio E320i-A0 32-inch 720p 60Hz LED Smart HDTV, it's awesome! I would purchase a Vizio E320i-A0 32-inch 720p 60Hz LED Smart HDTV since it's under $300! I use Vizio at my house, and it's been a good brand all around. I'd stick with it because I already know it comes from a line of great products. Vizio E320i-A0 32-inch 720p 60Hz LED Smart HDTV of course! I'd definitely try the Vizio for the small $300 it's worth. Vizio E320i-A0 32-inch Smart TV works for me. Vizio Smart TV of course! The Vizio E320i-A0 32-inch 720p 60Hz LED Smart HDTV sounds like a good deal. If the sound can be heard, I really am not fussy about the quality of it. I have a 42" Vizio in my family room that I really like. I love this one for the bedroom. I would buy a visio tv!! With $300, I would buy the largest brand name flat screen I could get. Not clue, I would have to do some research first, before deciding. A Vizio Smart tv ! Probably get a refurb with an extended warranty. I would buy this TV if my budget was $300. This Vizio seems like a good choice, but any Samsung or LG smart TV that cast less would probably be my choice. With $300. ? Are you kidding me? I would get a Vizio e320i wow! Would love to win it and place it in my dining room. I would definitely buy this Vizio. Such a steal for the price and the quality. I would get a Vizio E320i-AD 32" but I don't think it's only $300. where I live. I would buy the Vizio E320i-A0 32-inch Smart TV. Given the options I'd go with the Vizio. I've never had a problem with the brand and ever since owning a TV with network connectivity I couldn't possibly go without it. This one looks like a good one to buy. I'd probably buy the Vizio. Your review gave me a lot of helpful information and now I really want one. I would buy any 1080 tv that's under 300 because I mean it just depends on the quality and a good deal. I would buy a Vizio, I have purchased them before and they are a great brand for the price!! The the Vizio E320i-a0, of course. I'm not sure. I haven't done much research on which on is the best budget TV. I would buy the best overall one that I could. Even though it's 6 inches smaller, I think I would buy another Sony 3D PlayStation Display since my current one has a weird habit of turning the screen off then on again at random times when I'm not in 3D mode. They've been dropping in price and they are a perfect size for a bedroom TV. I usually check online through local ads selling used. The Vizio you got there does look like a nice one. $300? I guess I would by the Vizo if I could find one in my price range. Any TV that is 1080p, and at least 32". This would be great for my son. This Visio looks good on a $300 budget. Which TV would you buy if you only had a budget of $300? Probably the viso, or a tv found on sale. If all I had was $300 I wouldn't buy one. I really need to replace my tiny 19" with something like this!! I bought the Samsung just after Xmas for < $300. It does the job I bought it for - Kitchen TV. I would have considered the Vizio had I been aware of it. I'd buy the best TV on the market, a Vizio E320i-A0 32-inch 720p 60Hz Smart HDTV. That would be a Smart, and wise move on my part. To be honest, the network connectivity, both wired and wireless, is a must for me. That factor alone puts the Samsung and Toshiba models out of the running. With the Visio Internet Apps (VIA) platform, that easily puts it ahead of the others. I'm not crazy about the 720p resolution, as that is the bare minimum to be called HD. The price and feature set definitely make it an appealing purchase, though similar TV's like the Samsung UN32F5500, which is $409 on Amazon and is full 1080p (It's two steps ahead of the Samsung UN32EH4003) would be worth the extra $121. For this price, it's definitely a good choice. Vizio E320i-A0 32-inch Smart TV of course!! I guess the Vizio E320i-A0 32-inch 720p 60Hz LED Smart HDTV :) Thanks for the chance! Well, I would happily buy the Vizio E320i-A0 32-inch 720p 60Hz LED Smart HDTV, thank you. Despite the fact I am a huge Samsung fan, I would probably go with Vizio after reading this post. I would buy the best TV for 300 that I could find. would love to win this . I would purchase this HDTV if I needed one right now. I'd get the Vizio E320i. I'd get the Vizio. My friend has an older model in a larger size, and it looks great. I'd love to win this for my mother! Vizio E320i-A0 32-inch 720p 60Hz LED Smart HDTV would be a great choice! A Visio E320i! :) I have 2 other Visio's in the house that I love. This would be so nice to have. Your review makes it look like a great buy. A relative asked me for help when she was in the market for an HDTV. Bought a Vizio for her, and lied it so much she bought 2 more and I bought one also. I'd buy the Vizio E320i-A0 32-inch 720p 60Hz LED Smart HDTV. The Vizio E320i-AO 32 inch 720p 60 Hz LED Smart HDTV, for sure! Just the right size for the bedroom. I'd buy this Vizio E320i-A0 32-inch Smart TV. Oh, definitely a Vizio E320i-A0 32-inch 720p 60Hz LED Smart HDTV! i would buy this one! Not sure would have to get my husband's opinion. Vizio E320i-A0 32-inch Smart TV thats the one I would buy if I only had a $300 budget sounds like a great tv for a great value. The Vizio E320i-A0, of course! Great Tv! Would love to see this in any room in our home! I do not know, but this is a good choice. Vizio E320i-A0 32-inch 720p 60Hz LED Smart HDTV for sure!! I will buy Vizio E320i-A0 32-inch 720p 60Hz LED Smart HDTV definitely. Its a great budget Smart TV. Thanks for the review. Best one for that money, naturally. The Vizio E320i-A0 32-inch Smart TV since I not sure what else I can afford at that price. The Vizio E320i-A0 32-inch 720p 60Hz LED Smart HDTV has my name on it with that budget! If I had $300, I'd probably buy one of these TV's. I'd go with the Vizio. I respect the brand and the value it presents. The Vizio E320i-A0 32-inch 720p 60Hz LED Smart HDTV. I'm not sure, something with excellent Quality etc.., Smart,Samsung, etc.. Which TV would you buy if you only had a budget of $300? This one. Sounds like a nice, affordable TV!!! I would buy the Vizio Smart TV if I had $300 to spend on a TV. I'd choose the Vizio if I had the $300 budget! Maybe the Vizio E320i-A0 32-inch Smart TV? I would probably buy this one. I would buy a RCA. The Vizio hands down! Way better picture, more extras and just better TV. I would love to win this Vizio but I would but the Samsung. Ive had Samsung TVs in the past and they were great! But Vizio has tons of extras that make it hard to pass over. If I had $300, I would buy a tv from Samsung.... not because I don't like Vizio ...but for the simple fact that Vizio is just not available at all in India. My son has been harping all along about how Vizio should enter the market in India and how he would buy it at the drop of the hat. I trust his tech decisions. I would buy a Toshiba tv. I would buy the Vizio E320i-A0 32-inch 720p 60Hz LED Smart HDTV. I would buy a HDTV that's also streaming capable. Vizio E320-A1 - which is not a smart tv, but would leave me a little extra for popcorn! Of course it would be the Vizio E320i-A0 32-inch 720p 60Hz LED Smart HDTV ;) Thanks for the chance to win. I will buy this Smart TV (Vizio E320i-A0 32-inch) because it's a user-friendly, have a great apps, very large the screen, a cheapest Smart TV in the world, a complete port for a full entertainment experience, and more. If I win this giveaway, I'll use this Smart TV for my big family. i love vizio tvs. i would definitely buy vizio if i wanted another tv. I own a Vizio in the bedroom, it's fantastic so I would purchase another one for $300.00 or less. Great quality! Any Vizio I could afford in that price. We have 2 and we love them! the Vizio E320i-A0 32-inch Smart TV. i like it. Why the Vizio E320i-A0 of course! Vizio E320i-AO 32-inch LED Smart HDTV would be wonderful thanks. I would buy Vizio E320i-A0 TV. I'd probably wait for a deal on an LG factory recert. 1080p and 120Hz if possible. Looks really nice, hope I win. After reading this review, I would probably buy a Vizio tv. I have the same size tv, very similar stats but it's an Emerson and it's two years old. I already had to spend $75 to have the volume fixed. I agree 720p is very clear on this sized screen. I LOVE that it's a smart TV. If i had 300 and needed a small tv i would buy the Vizio E320-A0. Pretty good bang for the buck. What other 32-inch LED TV can you get for under 300, besides the Vizio E320i? Hmm, Guess I should research first .. But Vizio definetely on my list. After reading your review ... a Vizio E320i-A0 32-inch 720p 60Hz LED Smart HDTV of course! Well, after reading this review I'd probably go with this one! I might buy this Visio, but I would also have to see what other options were available. If I had $300 I would go for the best 1080p panel available in that price range at cost of not having smart features. I would probably buy this one for less than $300. I currently have two Visio's, a 42" and a 65". They rock! I'd buy a Nexus 4 instead. I'd buy the Visio Smart TV of course! The Vizio E320i-A0 is what I would choose. I already have review on it from here. So the homework is done, very easy. this Visio seems like a great buy at this price. I would buy the Vizio E320i-A0 TV. It just so happens that we had a tv go out and would like a new one! Sign me up for the giveaway! Vizio E320i-A0 32-inch 720p 60Hz LED Smart HDTV it really has some good specks love it. I think this Vizio would be a nice choice. I'd have to properly research all my options, but this review would definitely sway me in favor of the Vizio! Seems like this a pretty solid choice in the <300 bracket! I tok a step away from ky usual HP computer and purchased a Vizio desktop a few months ago. I have been surprisingly impressed with its performance. Based on this and most importantly, your review, I would definitely go with the Vizio Smart TV. "Which TV would you buy if you only had a budget of $300"? Probably this one. I have a 4 or 5 year old 720p LCD Vizio tv that produces a great picture from game consoles (Xbox 360 and PS3). I've used it for several hours (or more) nearly every day since I've had it so I'd like to get a new one before this one kicks the bucket. I would definitely buy the Vizio 32 inch LED Smart TV if I could for that money. The one detailed in this page. I've seen Vizio's and the picture is good. Glad to see the positive review. I cannot imagine a better value at this price point than the Vizio E320i-A0. With a budget of $300, this Vizio would seem to be the best bet. Looks like a great TV, would love to win it! This looks like a terrific "budget" TV for $300. I've been looking to replace my trusty old 25" Sanyo SDTV *and* get a Netflix box...looks like I have a winner. Vizio E320i-A0 32-inch Smart TV. Definitely looks like a winner in my book. I definitely will put my 34" HD Samsung in the bedroom. I honestly have no clue which I'd get, as I have no idea what's on the market at that pricerange. I would probably buy the largest screen sized tv I could find for the price, and hook up an htpc or a roku to it. A refurb Vizio 42-48 inch tv. Vizio E320i-A0 32-inch Smart TV? I wouldn't buy a TV if I had that money. Nice TV. Good for internet end home broadcasting. The most feature rich 300 dollar tv. This one TV household could use a second one like this. If I were looking for a $300 TV, I would give this Vizio model a hard look. Honestly, I would also look at the Samsung & Toshiba models as well. All other things being equal, I would take the best picture. Which TV would you buy if you only had a budget of $300? A Smart tv with operating system android. If I only had $300, I would use makeuseof and other tech sites to research the best tv for the money I had to spend. Reviews are more important than a specific brand. I would probably get this TV... but if I wanted a bigger TV, sacrificing some features, such as sound quality and the Smart feature, I would get a not so popular brand TV such as upStar or seiki. They have budget TVs that can get up to 42' or more without a big sacrifice in picture quality. The Vizio looks really good for such a low price. Vizio E320i-A0 for my room. All of out TVs are Vizio, This would make a great addition for our room without a streaming device. Samsung UN32EH4003 32-inch 720p 60Hz LED HDTV (Black) at 255 on Amazon now. Looks like one of the better ratings and I'm a fan of Samsung. That's not to say that this isn't a great option. I'm just a Samsung fan. Who knows, maybe this TV could change my mind. I'd have to look at some Samsung models, but this one would be near the head of the list at this price. After reading this article, I'd go for the Vizio E320i-A0 TV. I *do* have a $300 budget for a new TV, and still dont know what to buy. I would definitely purchase the 32" Vizio. My wife and I looked at them at WalMart and it has the best picture for our eyes by far. I would probably buy a samsung 32 from costco or sam's (easy returns). They seem to have better playback from thumb drives. Vizio E320i-A0 32-inch 720p 60Hz LED Smart HDTV. I actually already own one I got on Woot and am quite happy with it. I am seriously considering buying the Vizio E320i-a0. Would love to win it instead! Puts Alot of BANG for my BUCK !! Based on your review, I would say this Vizio seems like a great buy. It's a great price for a tv that packs a loaded punch. I would buy the Vizio E320i-A0 because your review convinced me and it really looks like it offers quite alot for its price. Thanks for sharing this sweat deal! Would love to win this to put in our bedroom. I would buy a Vizio E32i-Ao 32 inch TV.I would love to win this one though.My fingers are crossed.